In Montana, thousands of families are working hard for low pay and often struggling to get by. One of the most promising opportunities to support working families and boost our economy is the enactment of a state Earned Income Tax Credit (EITC). The Great Recession and other economic trends made it harder for Montana’s families to live above the poverty line. In fact, nearly 50,000 Montanans are working, but still living in poverty. A sluggish economic recovery increased the struggles for low-income families. In addition, the Montana income tax system taxes families at an annual income far below the poverty line, pushing them further into poverty. The federal EITC program has been one of the most effective anti-poverty programs in history, and a state-level credit could provide the same benefits to Montana families. · The federal Earned Income Tax Credit has been one of the most effective anti-poverty programs in history. · In 2013, the federal EITC lifted more than 6.2 million people, including 3.2 million children, out of poverty. · A federal and state EITC would effectively raise the wage of a single mother with two children by $2.95 per hour. · In 2014, 83,000 Montana families received the federal EITC. These same families would benefit from a state EITC. Why Does Montana Need a State Earned Income Tax Credit? Montana is ranked in the top fives states in the country to impose income taxes on working families experiencing poverty. Currently, we begin taxing a single person at $4,360, a single parent with two children at $11,100, which is 55 percent FPL and considered severe poverty, and a married couple with two children at $13,480. For example, a mother with two children living in severe poverty (55 percent FPL) is still subject to pay state income taxes. Enacting a state EITC would help mitigate the impact these low taxation thresholds have on Montana’s families and prevent them from being driven into - or further into – poverty. Recent economic trends have made it challenging for working families in Montana to make ends meet. Currently, a single parent working full-time for minimum wage earns $16,744 annually. That’s almost $3,500 below the federal poverty line for a family of three. Over 25,000 Montana families are working, but living in poverty. Unfortunately, Montana’s income tax makes it even harder for many families to afford basic necessities. What is the Federal EITC? Congressional Budget Office (“Options for Responding to Short-Term Economic Weakness,” January, 2008). The federal EITC is a tax credit created by Congress in 1975. Since the credit is refundable, the federal EITC acts as a wage supplement for low-income working families across the nation. Only working individuals and families that pay taxes are eligible for the EITC. In 2016, a family with three children could receive a federal EITC worth $6,269. The Federal EITC is Effective. In 2013, the federal EITC lifted over 6.2 million people, including 3.2 million children, out of poverty. The federal EITC and the Child Tax Credit lifted an average of 24,000 Montanans out of poverty each year, during 2011 to 2013. Strengthening the federal EITC encourages work among single parents. Since EITC benefits increase with earnings, there is an incentive for low-income individuals to work more and for the unemployed to leave welfare for work. Most recipients receive the EITC for a year or two to cover basic necessities. A survey of over 2,300 Montana tax filers found that 51 percent of respondents said they would use their federal EITC refund to pay off or catch up on bills, and nearly 140 individuals reported wanting to save their refunds. Tax filers also reported planning to use EITC refunds to make car repairs to have a reliable form of transportation, and purchase necessities like groceries and school clothes for their children. Recognizing the effectiveness of the federal EITC, 26 states have enacted state EITCs to further supplement the income of working families. Credits targeted to low-income families increase demand for goods and services because low-income families are more likely to purchase immediate needs like groceries, resulting in an economic boost in local communities. In 2014, the federal EITC injected $173 million into Montana’s economy. Military families benefit too. In 2012, 12,000 veteran and military families in Montana experienced reduced poverty because of the EITC. Rural areas receive a greater share of EITC than more populated areas, strengthening local businesses and communities. How Does the Federal EITC Work? Only low-and moderate-income families and individuals with earnings from work are eligible for the federal EITC. The size of the credit depends on marital status, family size, and income and is divided into three benefit ranges: (1) the phase-in range where EITC benefits increase as a percentage of earnings; (2) a plateau period where the maximum EITC amount remains constant; and (3) the phase-out range where benefits decline as earnings increase (Figure 1). Families claim the EITC when they file their federal income tax returns. How Would a State EITC Work? Most states model their EITCs after the federal credit. The best option for a state EITC is to offer workers a refundable tax credit that is equal to a fixed percentage of the federal credit. For example, Montana could offer an EITC equal to 10 percent of the federal credit. Linking state and federal eligibility makes the process easier and would allow Montana to take advantage of federal compliance and coordinated efforts to publicize the credit to eligible families. Like the federal EITC, a state EITC could only be claimed by people who are working and paying taxes. The process to claim the credit is simple and would have powerful effects for Montana’s working families. The EITC is first used to reduce a family’s tax liability, the amount an individual owes in taxes at the end of the year. If the credit exceeds a person’s tax liability, the remaining balance is returned to the individual in the form of a refund. In Montana, a state EITC set at 10% of the federal credit would result in a maximum benefit of $627 for some low-income working families. Who Would Benefit from a Montana EITC? Approximately 83,000 Montanans received the federal EITC in 2014. If Montana established a state EITC, these same working families would receive additional support through boosted wages and would be better able to meet their family’s needs. 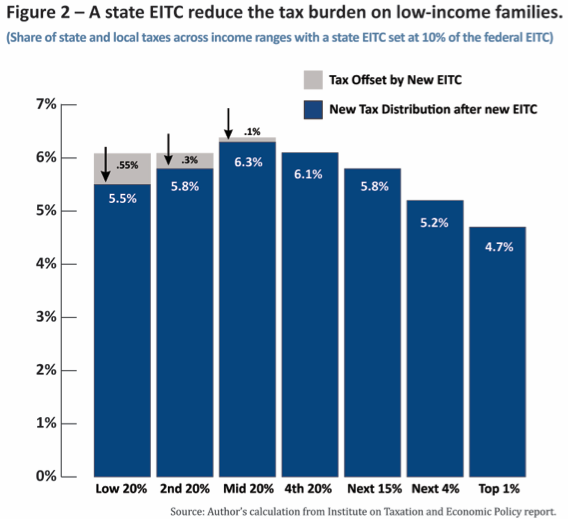 Additionally, low-income families receiving a state EITC would face a reduced tax burden. In Montana, low-and middle-wage workers pay a greater portion of their earnings in state and local taxes than do higher-income earners (Figure 2). For example, a single mother working full time and earning minimum wage ($16,744 annually) falls within the lowest income range subject to state and local taxes. Under our current tax system, this individual contributes 6.1 percent of her income to state and local taxes, compared to an individual in the highest income range who contributes only 4.7 percent of their earnings in taxes. Additionally, Montana remains one of the few states to impose income taxes on families already living in poverty. Montana begins taxing a single parent with two children with annual earnings of $11,100, the equivalent of 55 percent FPL, which is considered severe poverty. Like the federal credit, a state EITC would help offset the amount of state income tax this single mother owes. A state EITC set at 10 percent of the federal credit would reduce this single mom’s total share of state and local taxes from 6.1 percent to 5.5 percent, creating a fairer tax system altogether. In 2016, parents working full-time and earning minimum wage will still earn income that falls below the federal poverty line. However, a combination of state and federal EITCs would literally lift families out of poverty by supplementing their earnings and increasing their income above the poverty level. The increase in income from a federal and state EITC is equivalent to a wage increase of $2.95 per hour for a single mother with two children (Table 1). Notes: Gross earnings based on minimum wage ($8.05/hr), 40 hrs worked per week, and 52 work weeks per year. * Benefit if state EITC set at 10 percent of the federal EITC. ** A single childless worker and a married childless worker with qualifying income can receive a federal EITC worth $506. In 2014, 21 percent of tax filers in Montana were eligible to receive the federal EITC. If all tax filers claimed the EITC, over 226,000 Montanans would benefit, including over 95,000 children. Among EITC-eligible filers, 85 percent identified as white, non-Hispanic (78,574 people), 9 percent identified as American Indian (8,320 people), and nearly 4 percent identified as Hispanic or Latino (3,235 people). Children are one of the most important beneficiaries of the EITC. The federal EITC is the nation's most successful anti-poverty program for children. Without it, the number of children living in poverty would be 25% higher than it is today. The benefits are also long lasting. Children who move out of poverty in early childhood tend to perform better in school, are more likely to graduate on time and attend college, worker more hours as adults, and experience higher earnings as a result. With benefits that extend from one generation to the next, the federal EITC helps set a child up to succeed through every stage of his or her life and helps them move beyond cycles of poverty. Many working Montanans earn low wages. Even families with full-time and year-round workers earning minimum wage struggle to afford essentials like housing, transportation, and child care. Table 2 lists the top industries and occupations in Montana based on the share of workers in each that received the federal EITC in 2014. For example, 12 percent of eligible workers in the food preparation and related services sector, including cooks, servers, and dishwashers received the federal EITC. In Montana, over 46,000 individuals were employed in the food prep and services sector in 2014, and earned an average wage of $10.18 per hour. The federal EITC helps supplement low-wage jobs and promotes stable employment so that individuals can work more, advance in their jobs, and get on a path toward a more financially secure future. On average, about one out of every six tax filers in Montana claimed the federal EITC in 2013. While nationally, most beneficiaries live in large cities, rural areas receive a disproportionate amount of the benefits relative to population size. This is also the case in Montana where 21 percent of federal tax returns filed in rural areas contained EITC claims, compared to 17 percent of federal tax returns filed in more populated areas of the state. 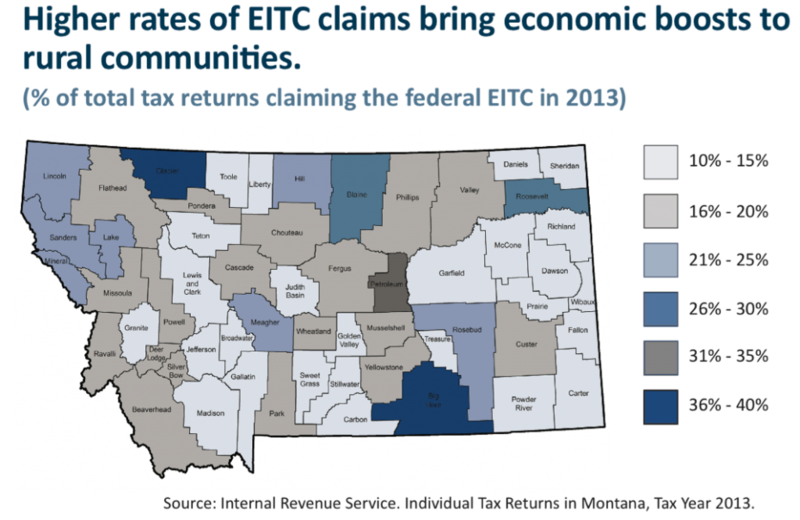 Between 26 percent and 38 percent of tax filers in counties like Glacier, Big Horn, Roosevelt, Blaine, and Petroleum received the federal EITC in 2013 (see map). The federal EITC brings financial boosts to local businesses and strengthens economies in rural communities. In 2014, the federal EITC injected $173 million into Montana’s economy. A state EITC set at 10 percent of the federal EITC would contribute an additional $18 million each year into the pockets of working families who claim it. EITC recipients will spend their additional income at the grocery store, the gas station, and other businesses. By placing the money in the hands of the people most likely to spend it, a state EITC would increase demand for goods and services and boost local economies. The Montana legislature has the opportunity to provide greater support for working families through a state Earned Income Tax Credit. The state EITC, modeled after the federal EITC, represents an effective, efficient, and targeted mechanism to help encourage work and support families and local communities. At a time when the state is facing lower revenue levels, any tax policy that reduces state revenue should be approached with caution. A state EITC would carry a modest cost with a good return on investment. A state EITC, set at 10 percent of the federal EITC, would cost approximately $18 million. These funds would be injected into the pockets of hard-working families across Montana’s communities. The Montana legislature has a number of options to offset this investment and make the tax system fairer. Montana is one of only nine states that provides a tax break for income derived from investments, called the capital gains tax credit. The creation of a tax break for capital gains income has created a tax system that favors wealth over work. Capital gains tax breaks mean individuals with incomes from wages pay higher tax rates than people whose income comes from growth in investments. This tax break costs the state nearly $30 million in lost revenue each year, with more than half of the capital gains tax cut going to the wealthiest 4,500 taxpayers (those earning more than $364,000). A reduction in the capital gains tax credit could pay for the creation of a state EITC. Other options to offset the cost include further reducing the allowable deduction for federal income taxes paid, capping itemized deductions, increasing itemized deduction phase-out, or matching up the personal exemption phase-out to federal code. A state EITC is an incredible opportunity for Montana to improve the lives of low-wage workers and their families across the state. However, the EITC benefits far more than the state’s low-income workers. The credit boosts the economy, protects children, and helps keep costs down for employers. By encouraging people to work, and supplementing their wages, the federal EITC program has been a successful anti-poverty program. Montana should take this opportunity to help make work pay for low-income and working families. Our families, communities, and the economy will be stronger as a result. U.S. Census Bureau. American Community Survey 5- Year Estimates. Employment Status in Montana. Assuming individual earns minimum wage ($8.05), works 40 hours a week, 52 weeks in the year. A total of 148,469 individuals in the labor force had children under the age of 18 in Montana. 17% of families (25,240) were below the poverty line. United States Census Bureau. American Community Survey 5- Year Estimates (2010-2014). Survey results on file with author. In 2016, the Montana Budget and Policy Center collaborated with the Montana Credit Unions Network to create and disperse a short survey through Volunteer Income Tax Assistance (VITA) sites to gather information about how federal EITC recipients in Montana plan to spend their refunds. Seth Hartig, Curtis Skinner, Mercedes Ekono. Taxing the Poor: State Income Tax Policies Make a Big Difference to Working Families. National Center for Children in Poverty. November, 2014. 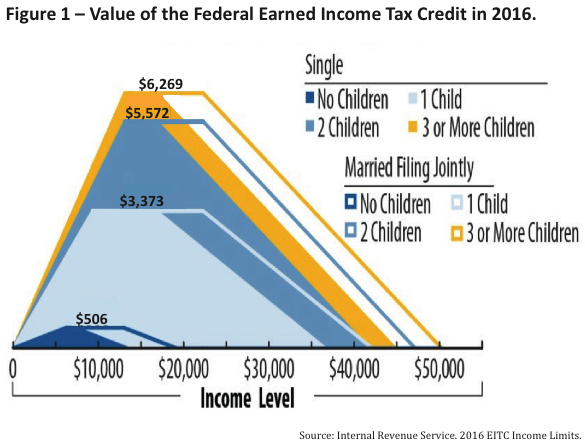 Single-parent and married-couple families with three or more children and qualifying earnings could receive a 2016 federal EITC worth $6,269, and a state EITC worth $627. Williams, Erica. How Much Would a State Earned Income Tax Credit Cost in FY 2017? Center on Budget and Policy Priorities. January, 2016. Data on file with author. Montana Department of Revenue. “Top 1% of Households, Total Income, Tax, and Capital Gains Income.” Accessed June 2016.